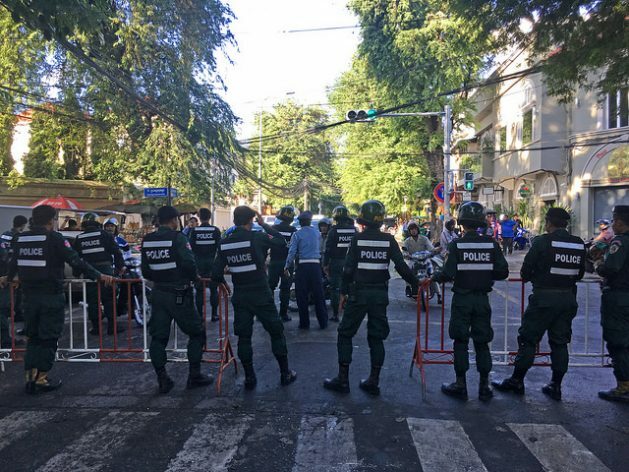 PHNOM PENH, Nov 17 2017 (IPS) - The government had an almost paranoid fear of protests. A square kilometer around the Supreme Court was barricaded and off limits to the public. In faraway provinces, roadblocks were erected to stop demonstrators. Some opposition members were under temporary house arrest. But it turned out to be unnecessary. Nobody dared to protest. The Cambodian government has launched a fierce crackdown on the opposition. For a few months now, politicians, journalist and activists have been harassed to make their work impossible. A new low point was reached on Thursday when the Supreme Court dissolved the CNRP (Cambodia National Rescue Party) ahead of the elections in 2018. Only the CNRP could have competed with the CPP (Cambodian People’s Party), which has been in power for more than three decades. Hun Sen is the world’s longest serving prime minister. The official dissolution of the CNRP was just a formality. The president of the Supreme Court is also a top committee member of de CPP and a longtime ally of Hun Sen. In Cambodia, justice is an auxiliary of the government – and the prime minister is pulling all the strings firmly, now more than ever. “I could easily continue for another 10 years,” the 65-year-old Hun Sen told reporters on Thursday. Consequently, he acknowledged that he doesn’t consider an election as a consultation of the people, but as a way to varnish his dictatorial regime with a thin layer of legitimacy. The CNRP was the last democratic obstacle to his power over the country’s resources, which he needs to buy support from the elite. 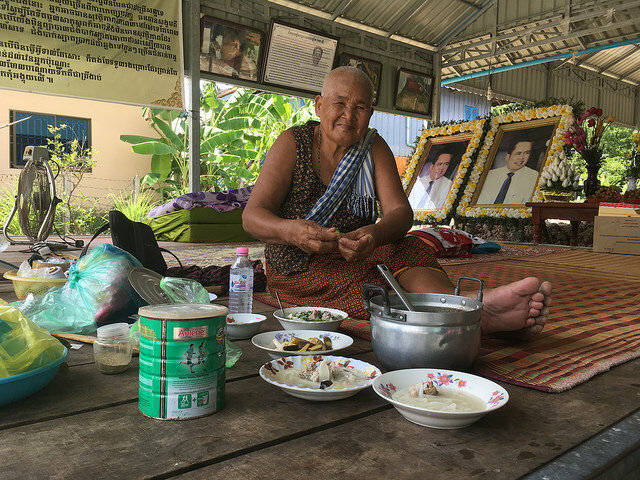 Since the government stepped up the crackdown on democracy, few Cambodians dare to speak out in public – certainly since the murder of Kem Ley, a popular journalist and a government critic. That was a turning point. Until then, Cambodians thought that their country would slowly become more democratic. But that hope was buried together with Kem Ley in his hometown Takeo. His mother is cutting vegetables at the grave of her son. Phauk Se had done that every day since July 2016. Next to the burial site are pictures taken moments after the shooting. Kem Ley is lying between tables and chairs, a puddle of blood under this head. He was killed while he was having his morning coffee in a gas station in Phnom Penh. “The rich are getting richer and the poor are getting poorer,” a woman says in her stall filled with colorful dresses. “We want change.” Most of the shopkeepers at the market use the same word to express their disappointment with the government. The CPP knows it can’t survive a new popularity test. The CNRP almost won the elections of 2013. It made more progress with the local elections in June. It’s evident that the elections due in July 2018 are causing anxiety at the CPP headquarters. To prevent a defeat, it has started the final assault on the opposition. The CNRP is now dissolved and the party’s president Kem Sokha is in prison. Five thousand mandatories lost their jobs and half of the 55 members of parliament have fled the country. Mu Sochua is one of them. She is preparing a vegetable soup during the phone call with this reporter. The sound of cutting, chopping and grating makes a fitting backdrop to the combative language of the vice-president of the CNRP. “The dissolution of the CNRP is a big miscalculation of Hun Sen. The discontent will only continue to rise. Until now the CNRP has channeled this peacefully. But soon people might take their anger to the streets,” Mu says from a Moroccan kitchen. She fled Cambodia after she was tipped off about her impending arrest. The Cambodian economy strongly depends on tourism and the garment industry. If the factories stop producing, 700,000 workers will lose their jobs. Hun Sun would have a major crisis on his hands. Human rights groups condemned the dissolution of the CNRP and asked the West to act. “The international community cannot stand idly, it must send a strong signal that this crackdown is unacceptable,” said James Gomez, Amnesty International’s Director of Southeast Asia and the Pacific. The European Union issued a critical statement in which it linked human rights with access to the European bloc’s reduced and zero tariff trade scheme. The US government decided to discontinue funding for the NEC (the Cambodian election body), in case it still bothered to organise elections.